The item in this review was provided by Pistol Lake for review purposes. Pistol Lake recently gave me the opportunity to try out their Minimalist Boxer Brief, which is made out of the same Lightweight Eudae fabric as their Minimalist Tee (our review). I’ve been testing these for a few months now, and they have some compelling attributes, including great resistance to riding up. The custom Lightweight Eudae fabric is 76% recycled polyester, 19% Tencel, and 5% spandex. You might think that with the high polyester content it will feel just like all the other synthetic underwear out there, however it doesn’t. The Tencel (Eucalyptus pulp derived fiber) gives the fabric a luxurious soft feel, you might even believe it’s a stretchy cotton. When sewn up as boxer briefs, this makes for an extremely comfortable pair of underwear. I found myself right on the borderline of L and XL according to the size chart, so I gave both a try. If you are in the same situation and are looking for a tight, more supportive fit size down, otherwise size up. With a longer leg length and great stretch, these boxer briefs do a great job resisting riding up, especially if you wear them on the tighter side. They are my only underwear, other than some with special leg grippers, that I’ve never had issues riding up while working out. Another area some other underwear can have issues is the waistband. On these, It is nice and wide and is thick enough that it stays flat and never digs in. If there was anywhere I’d recommend some improvement in the fit, it would be to add some shape to the pouch — something that can take a great pair of boxer briefs and make them excellent. The Eudae fabric does a great job of wicking moisture. While it does hold more than a full polyester or nylon fabric, it dries almost as fast. During really sweaty workouts, these can start to feel a little like wearing cotton. They don’t hold as much sweat as cotton, but I did notice that they felt more sweaty than my other performance underwear. In this situation, the quick drying nature only helps once you are done heavily sweating. As far as odor resistance, I have never found underwear to be something I want to/can wear more than once (even merino), so I can’t comment. However, the Eudae fabric in its t-shirt form, performs almost as well as merino (and better than full synthetic, see our comparison). Of course, the topic of packability and drying speed is also a factor for travel. In comparison to other options, they are about middle of the road as far as packability and while fast drying, not as fast as some of the thin, pure synthetic blends. 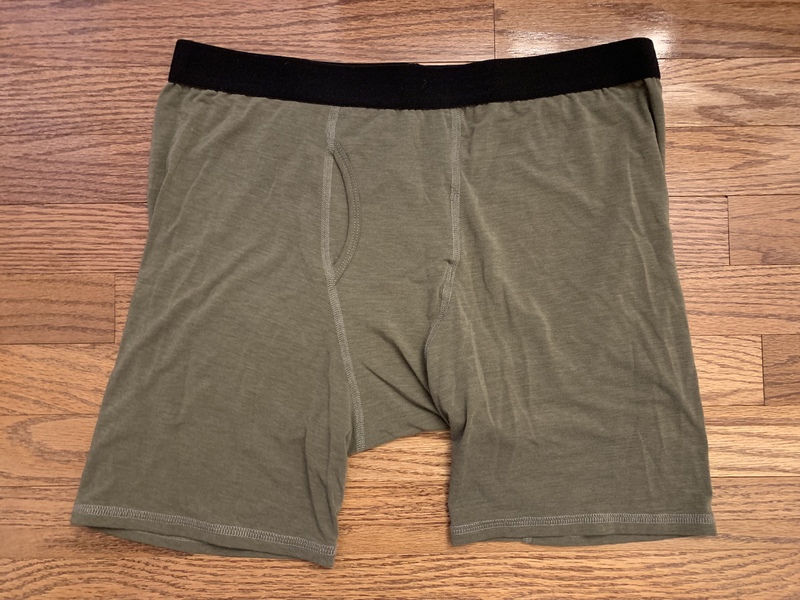 The Pistol Lake Minimalist Boxer Briefs are compelling mainly in the comfort area. They also solve the problem of riding up with their length and the stretch of the fabric, which isn’t something that most $29 pairs of underwear can do. However, my experience with them during very sweaty workouts makes them less than ideal for me. They are worth a look, however, if you want cotton-like comfort with great stretch, don’t sweat a ton when working out, or are traveling (where sweat and heat aren’t a concern) and want the comfort and drying performance these offer.